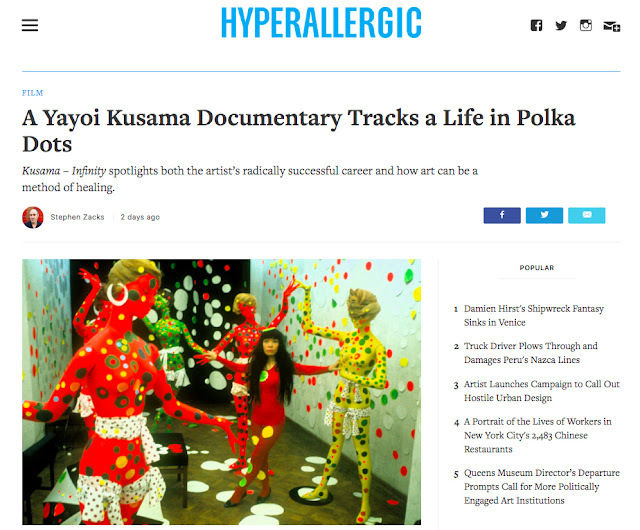 A Yayoi Kusama Documentary Tracks a Life in Polka Dots: Kusama – Infinity spotlights both the artist’s radically successful career and how art can be a method of healing. The film portrays the young Kusama, a daughter of wealthy seed merchants, growing up in rural Nagano Prefecture, with panning images of her from family photos in the country fields — one of her earliest visual references. As a child, Kusama discovered painting as a refuge from her parents — her mother, she has said, continuously scolded her and ripped up her drawings, and her father was a womanizer. The activity of making art also provided her relief from the dot-infused hallucinations she suffered from at an early age. Turning down arranged marriages, Kusama utterly lacked a sense of self-doubt as she pursued a career in painting. In her youth, she penned a letter to Georgia O’Keeffe, who invited Kusama to her ranch in New Mexico and encouraged her to move to New York. Cue the swelling orchestra.